Cheltenham is behind us, and the flat season is officially underway and this weekend we have the last major jumps meeting of the year which is, of course, nations favourite horse racing spectacular – The Grand National. Grand National betting is a craze that sweeps the nation once a year. Up and down the country people will be gambling in an attempt to find Grand National winners. Offices will be tearing up their favourite newspapers to do an office syndicate or sweepstake. It’s the one time a year that everybody turns into a punter. The race fuels interest in racing each year and probably fuels a bit of interest in the gambling commission as problem gambling is likely as it’s an impenetrable betting market! 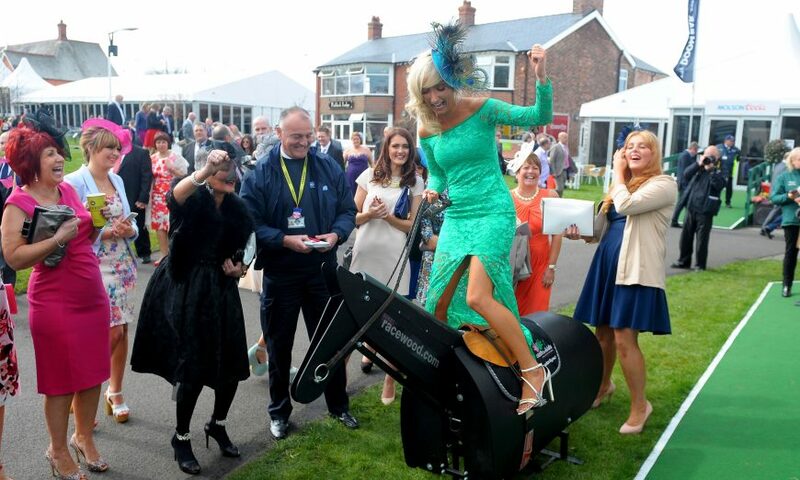 To be fair, it’s pretty unique and while Cheltenham attracts the more serious and expert punter, the Grand National is undoubtedly the race that everybody knows and anyone usually has a punt or gets involved in some form or another. That usually throws up some great trading and betting opportunities. I’ve traditionally done well at the Grand National, it’s a weekend I wouldn’t give up trading. I often find it frustrating as a Betfair trader, not because of the lack of opportunity. But because it is the one time each year I guarantee that everybody asks me for some Grand National tips. So lets start there with some advice you can give somebody if they want a bet on the Grand National. Grand national odds show the super competitive nature of the race and that’s a reflection on just how hard it can be to pick a winner out of the 40 horses running on Grand National day. Picking one winner from the grand national runners is a really impossible task. But let us have a go at that so you can give some advice!! If you take bookmaker odds you’re gonna get shafted for want of a better word. So my first real tip for you or anybody betting on the Grand National is to not use a bookmaker. Find a betting exchange to place your bet with, as on a betting exchange if you do happen to win, then you’ll win a lot more money. Placing a bet online is preferrable as well. The competition is fierce with online gambling so you will get a better price especially if you take up a promotional offer. If you use a betting exchange you can use trading software to improve your functionality when betting in different ways. Grand National favourites tend to make really bad bets, you may want to lay them. In the twenty years I’ve been actively watching the grand national live, virtually none have won. When I ran the data over much longer periods, before exchanges, the picture didn’t improve. Bookmakers love to have a story on the national and that tends to shorten the favourite to odds beyond where they are reasonable value. Don’t back a favourite. It’s a good idea to have a horse that has been out racing regularly. Try to choose a horse that has been running fairly recently and preferably one over a reasonable distance, preferably over three miles. Grand National winners have raced eight weeks or less prior to winning the Grand National and only two of the last 21 winners had fallen or unseated their rider more than twice prior to winning. Younger horses have a terrible track record at the Grand National as do older horses. So try and look for horses that are aged somewhere mid-range. When I looked at the stats since 1950 the winner tended to be a nine year old by frequency, with 35% of winners being that age. The range fell into 8-12 year old’s, peaking at nine and sloping away from there. 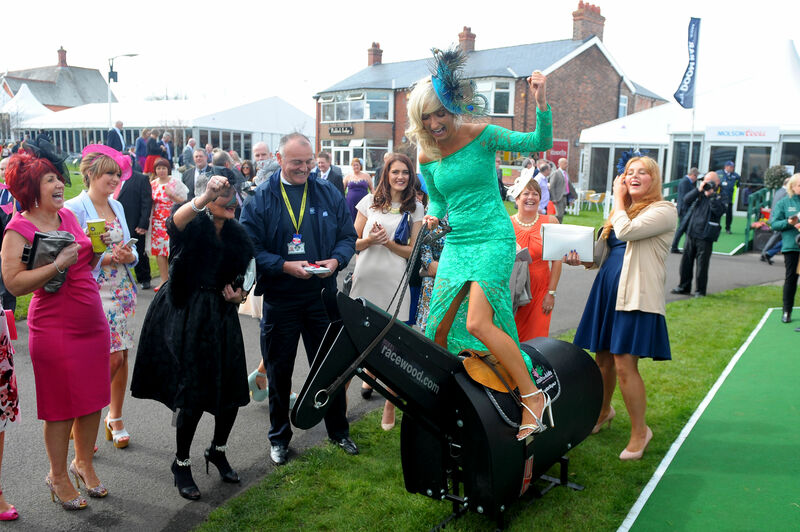 The Aintree festival starts on Thursday and takes place over 3 days. So the first thing to note is that it is one day shorter than other festivals like Cheltenham and Royal Ascot. 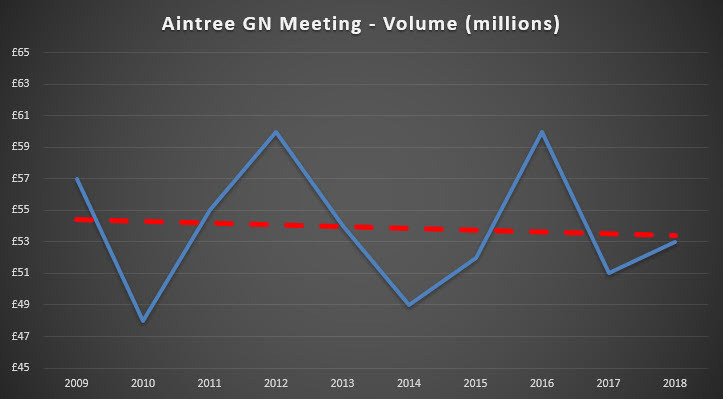 Based on past years, I’d expect the turnover for the three days to be between £40m – £50m with around £9m traded pre-race on the Grand National itself. Most races exhibit similar characteristics and volume is quite high to start with and builds consistently during the day. 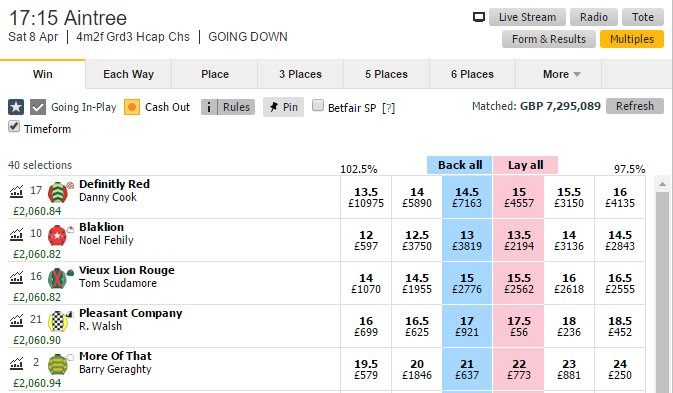 The Grand National whowever is an active market for most of the day and builds quickly in the last half an hour. The Grand National start time is 17:15 and is an hour later than when I first started trading it many years ago. The later start time is useful as there is more time for money to arrive, but it can skew my entire results on the Saturday to just the Grand National itself. So the pressure is usually on when we approach the big race! Unlike the Cheltenham festival, you won’t see large chunks of money stacked up waiting to be matched around the current price. So you won’t have the frustration you can sometimes get sitting and waiting for ages for your orders to be filled prior to the big race itself on Saturday afternoon. This will happen on the Grand National itself though and money will arrive in the market earlier and bigger than you would see on any race throughout the year. Generally though, most races will trade like a regular Saturday afternoon with each feature race looking to turnover around £2m pre-off. 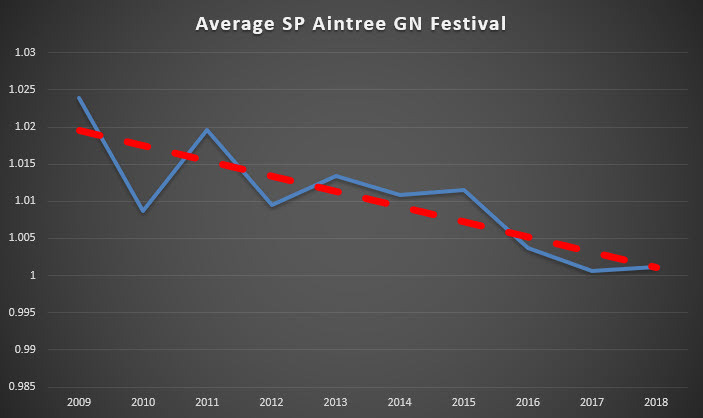 For such a large field the BSP can still be very will often still be very close to 100%, in fact in two of the recent years it has dipped below, so you could have backed all runners at SP and secured a profit before the runners at the back of the pack even set off. Like some other meetings that we see during the year, that have competitive markets, the overound on the starting price at the meeting is gradually getting tighter and tighter. If you’re looking to lay the field rather than doing so at less than 2.0 as you normally would you might want to look at doing so at slightly odds higher odds somewhere between 3.0-5.0. You will need to get more runners matched to lock in your profit, but the data does show that is more likely than laying at lower odds and that makes sense when you think of the distance and number of runners involved in this race. Alternatively, you may want to look at DOBing, while none of the eventual winners have come from the top four in the betting since one of the joint-favourite won back in 2008 using a DOBing or back 2 lay strategy on the front 4 usually works quitee well. In seven of the last eight years 2 of the front 3 have traded at 50% there BSP or lower. All that’s left for me to say is good luck to everyone who trades it and I hope that we get to see a quality race to round this year’s jumps season off.